In 1842 Lieutenant John Fremont of the U.S. Army was the first person to truly document white water rafting after his expedition on the Platte River in Nebraska. Then rafts were constructed from four independent rubber cloth tubes and wrap-around flooring. 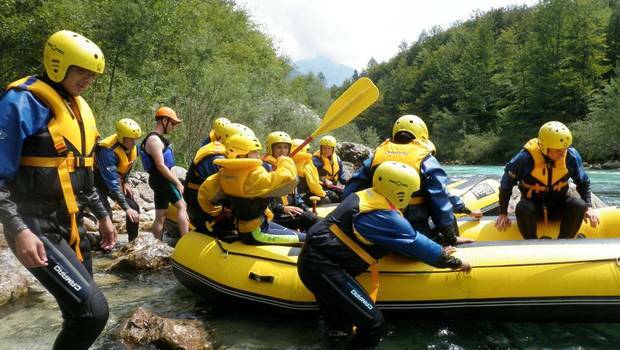 Thankfully rafting technology has evolved considerably making this one of the most exhilarating activities you can now do and, wherever it is featured, is nearly always listed as the favourite activity by kids and adults alike. 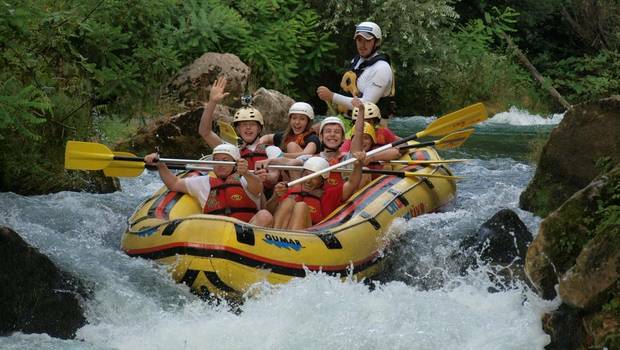 Rafting is a wonderful group experience, normally with around eight people sharing a raft with a fully trained guide steering, whilst you enjoy a true rollercoaster experience. Armed with your paddle you almost feel like a true pioneer of the wild frontier except you are wearing a neoprene wetsuit, helmet and life jacket. You are the engine room – and the guide tells you when to paddle forwards, backwards, sideways and sometimes all three in one rapid. It is simply a fantastic way to get wet and get the adrenaline going. The beauty of rafting is that it is never the same experience. No two rivers are the same, all rapids vary and each has their own unique and beautiful surrounding scenery. Where can I go to experience rafting? Each river is different and they are graded from 1-5 in terms of the rapids. The vast majority of great rafting experiences will not see you exceed a grade 3 rapid. For example, our rafting trip on the Noguera Pallaresa River in the Catalan Pyrenees never exceeds level 3 and yet is widely recognised as simply one of the best rafting experiences in Europe. Miles of constant rapids with just a few flat stretches which allow you to take in the fabulous scenery before bursting through the next rapid! There are some exceptional jungle rafting experiences to enjoy too on the rivers of Borneo and Costa Rica which allow you to enjoyably explore the rainforest scenery in an active way. Above all wherever we go rafting you are safe in the knowledge that you are in the hands of some of the best trained guides in the world. Safety is our mantra and briefings are always delivered clearly and comprehensively. Most of the rafting experiences we offer are designed with beginners in mind so you need not worry too much if you have never rafted before. In order to really get the most from rafting you need to be able to work together as a team and of course be comfortable in the water as there will be lots of splashing and occasional falling in! You will be fully equipped with life jackets and helmets though, with the guides there to keep an eye on you at all times. You should all be able to swim at least 25 metres. As white water rafting experiences take place in completely natural rivers, they will be impacted by the weather – heavier rainfall means bigger rapids, whilst drier times may make the experiences a bit tamer. Fear not though, our expert guides will make sure you get maximum enjoyment regardless of the conditions.